Akwa Ibom State Governor, His Excellency, Mr Udom Emmanuel flags off the construction of Abak ten 18.97km road in Abak Local Government Area. Represented by the Honourable Commissioner for Works, Mr Ephraim Inyangeyen, Governor Emmanuel says he will not relent but keep working for the people of Akwa Ibom State. Governor Udom Emmanuel said the 18.97km Abak 10 road traverses Ibaikpan, Abia Okpo and Mmanta communities which have been long cut off from each other because of the deplorable road condition. He assured the people that the Construction Company, J. P Sigma Nigeria Limited has the capacity and will complete the project on schedule. Governor Emmanuel charged the communities to cooperate with the contractors and avoid any acts that will intimidate or cause a delay of the execution of the job. In his welcome address, the Councilor representing Otoro Ward 3 in the Abak Legislature said the people of Otoro in particular and Abak in general are happy to receive the Governor and his who he said he is the in law of Abak Five and thanked him for remembering the area which seemed forgotten over the decades. The Clan Head, HRH. Obong Sylvanus Udofia expressed appreciation to Governor Udom Emmanuel on behalf of his subjects for the gesture and endorsed his second term bid. 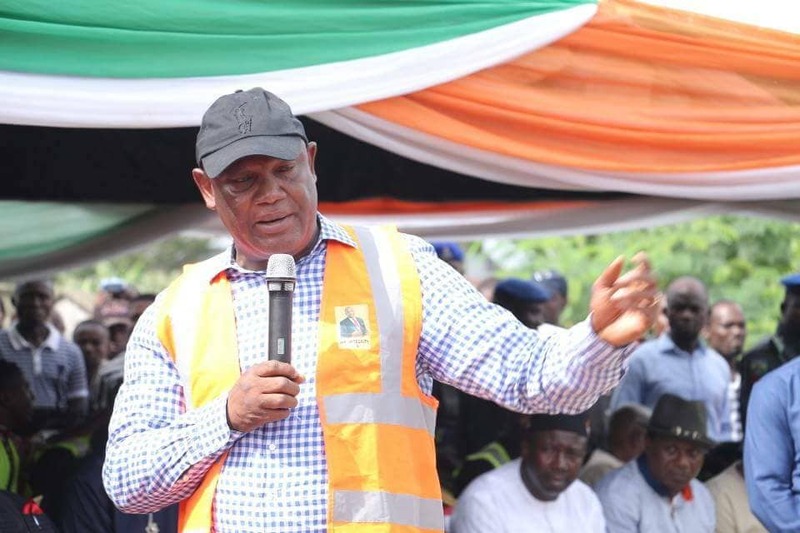 Obong Udofia assured the governor that his people will give maximum support and guarantee security for the contractor executing the project so that the work is completed on time. Also speaking, the Member representing Abak State Constituency in the Akwa Ibom State House of Assembly, Rt. Hon Elder Friday Iwok, scored the governor high on performance, observing that, he has kept his campaign promises to the people. Elder Iwok who commended Governor Emmanuel further added that, he is proud of the foresight of the Governor in appointing Mr Ephraim Inyangeyen as the Commissioner for Works, positing that he has performed exceedingly well. He thanked Governor Emmanuel for commissioning a fertilizer blending plant in Abak, a cassava processing mill and Government Girls College, Ikot Ekang, all in Abak, maintaining that, Abak has benefitted tremendously from his administration. He assured the governor of the massive support of Abak people come 2019, to reciprocate his good works in the removing shame from Otoro clan and Abak Local Government as a home. Elder Iwok charged the people to rise and stop the massive killing going on around Nigeria by voting out the APC led administration and returning the PDP to power to return Nigeria on the path of greatness, security and prosperity. Elder Iwok presented copies of the Holy Bible as gifts to Governor Emmanuel and Commissioner Inyangeyen, on behalf of his constituency and prayed the divine blessings covenanted in the Bible to be their portion. Those who graced the event which witnessed youths displaying placards of gratitude and endorsement of Governor Udom Emmanuel and women groups with cultural displays included traditional rulers, the Permanent Secretary of the Ministry of Works, Elder Effiong Essien, members of the PDP in Abak and stakeholders in the Otoro axis.